Younger voters may feel frusterated that their vote won’t make a difference in the upcoming Ontario provincial elections. While this feelingof frusteration is fair, it doesn’t have to be the truth. With the upcoming provincial election in mind, here is a brief summary of the platforms and leaders for the Liberal, New Democrat, and Progressive Conservative parties in Waterloo. NDP: The current Member of Provincial Parliament (MPP) for the Waterloo region, Catherine Fife (pictured above, right), is running for her third term. Her party’s focus is on creating unity and support throughout the community with improvements to all health care, parent-child programs including child care, and education. A major part of the platform is in health care, with a push for continued improvements to mental health care for youths, increasing access to therapy practices, and more care for Alzheimers patients. Fife has been in office for six years and in that time has helped to balance a $675M education budget that services 60,000 students and 5,500 faculty members. Liberal: Dorothy McCabe (pictured above, left) promises a better sense of community within the Waterloo region. She wants to raise the minimum wage to $15, reduce the cost of tuition, maintain the free prescriptions for people under 25, and improve public transit through GO and GRT. McCabe is very active within the community as her previous job was chief of staff to the mayor of Waterloo and she is currently a senior executive with the KidsAbility Centre in Kitchener. McCabe’s main focus is on family life where she promises to incorporate her work into her politics. She was also an advocate for all-day two-way GO train service in and out of Kitchener that has recently come into effect. PC: Dan Weber recently won the tories vote to try and unseat the current NDP leader in Waterloo. His main focus is on the community; his resume reflects this with volunteer and work experience at St. Jerome’s University, BlackBerry, Junior Achievement of the Waterloo region, and the KW Community Foundation among others. He focuses on the financial health of the province. The Ontario government’s budget seats it at a defecit of more than $300M that will continue to be in the red for at least the next six years. A new balanced budget, tax cuts, and new spending are a priority for Weber’s party. Green: This year, Richard Walsh a member of the Laurier department of psychology, hopes to the lead his party to a riding victory. Walsh is a previous NDP member who ran for their party in the early 2000s. The Green party is focused on three main things: jobs, people, and the planet. Walsh in particular is concerned with what he knows best when it comes to people their mental health. Walsh ran for the Green party back in 2015 with similar ideations as he has for this coming election. Of course, the Green party’s major concern is the physical environment itself but Walsh believes that the environment is tied together with a lot of the party’s other major areas of concern. 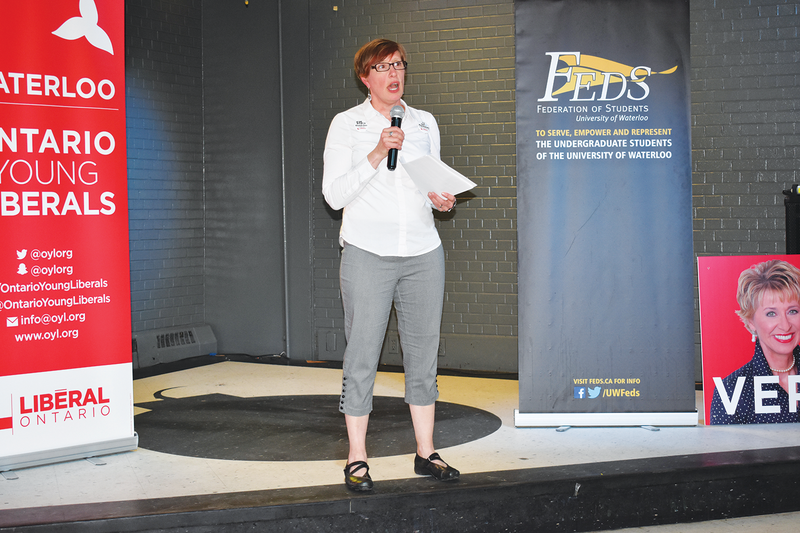 The Federation of Students is hosting Politics at The Pub events leading up to the election, the NDP and Liberal event has already passed but if you hope to connect with the Conservative or Green Party leaders their events are on May 22 and May 28, respectively. The events offer free food and the chance to ask burning questions to the riding leaders in an intimate setting. Make a sound choice by being informed and voting this Jun. 7, 2018 in the provincial election.